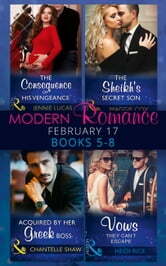 The Consequence of His Vengeance – Jennie Lucas Ten years ago, with her father arrested for fraud, Letty Spencer became the most hated ex-socialite in Manhattan, forced to push away the only man she’s ever loved. Now, Darius Kyrillos is no longer the poor chauffeur’s son and he’s come back to claim her! The Sheikh's Secret Son – Maggie Cox Darcy Carrick is older and wiser now…she will not bend so easily to Zafir’s will! Once her heart would have soared to hear Zafir call her his wife. Now it will take more than soft words and sweet seduction to win back her love… Acquired by Her Greek Boss – Chantelle Cox Alekos knows that he can offer beautiful Sara Lovejoy the ability to meet her family under his protection, whilst also securing a secret deal… providing she agrees to become his mistress! But his best plaid plans are about to go awry, because her innocence is the one thing this powerful tycoon is about to realize is priceless. Vows They Can't Escape – Heidi Rice When she jets off to New York, divorce papers in hand, Xanthe is prepared for the billionaire bad boy’s slick offices… but not for the spear of lust that hits her the moment she sees Dane Redmond again! Has her body no shame, no recall of the pain he caused? But Dane is stalling… Is he really checking the fine print or planning to stir the smouldering embers of their passion and tempt her back into the marriage bed?